The mention of John Rigdon's name frequently raises the question, "Was he related to Sidney Rigdon, the famous Mormon theologian?" John probably wished many times that he was not, but the better-known Sidney was his cousin. They grew up together near Pittsburg and remained friends (but not agreed) through the developing years of Mormonism. He testified under oath that Sidney did not write the Book of Mormon. The rise of the Mormon teachings caused Alexander Campbell to write arefutation of the system that had been espoused by his friend and frequent house guest, Sidney Rigdon. Alexander Campbell wrote a number of refutations of the emerging Mormon doctrine. One entitled Delusions can be read in full online. John was born and raised in Allegheny County, Pennsylvania. His birth was four years before the turn of the century - in 1796. Early in life, he was a member of the Peters Creek Baptist Church in Washington County, Pennsylvania near where Thomas and Alexander Campell lived. The congregation was well aware of, and resistant to, their anti-creedal views. Rev. Mr. Phillips continued to discharge the duties of pastor of the Baptist Church until 1824, when he became disqualified by his great age. He died in 1829, of paralysis, leaving many relatives and friends, and loved and honored by all who knew him. John had been trained to do the work of an evangelist. Moving west, he planted a Baptist Church in Erie County, Ohio in 1818. That same year he fell in love with and married 20-year-old Catherine Logan. Eventually they had seven children. Then very soon John and Catherine, along with his brothers Thomas and Charles, were members of the Pigeon Run Baptist Church in Stark County, Ohio. John had followed the emerging work of Alexander Campbell and was slowly accepting its truth. He was attracted to the claims of being simply a Christian without headquarters or creed books, and he identified with the movement of Christian only, today called the Stone/Campbell Movement. 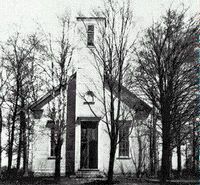 By 1824 he had organized the first Disciples Church in Ashland, Ohio. Being present when the decision was announced, he immediately rose and proclaimed to the congregation that he would preach from a stump in the vicinity of the church building, and at the hour named by him, for he had for his audience the whole congregation . . . . The result was, that on the same day, he baptized nine, and his labors continued very successful. His family stood with John as he made the transition to the Churches of Christ (Disciples). Stephen, his oldest surviving son, eventually made the long trip to Oregon and was a respected member of the Pleasant Hill Church of Christ. Mary, wife of Elder John Rigdon of Morgan Co. ILL., died Friday, March 25, 1836. Eldest daughter of Roger and Elizabeth Laughlin of Adams Co., died in 36th year of her age. She left a husband, aged parents, brothers, and sisters, and an only child, "a son of days too few to feel the loss he has sustained." They were stong, rugged men, deeply rooted in the gospel, and staunch advocates of the Restoration movement. Among these were . . . Barton W. Stone, John Rigdon, Jacob Creath . . . Pardee Butler (of Kansas fame) . . . with an occasional sermon by Alexander Campbell. In 1837 John married again, this time to 30-year-old Mary Bell. It was Mary that was by John's side all of the way to Oregon. In the early 1840s, John entered Alexander Campbell's Bethany College in what is now West Virginia. After leaving school John and his family began moving westward, evangelizing as they migrated. He was a scholarly man, one who knew the book well, a man of force, zeal, and great pulpit ability. Among the prominent preachers of that period, was John Rigdon, who moved into Louisa County at an early day, and travelled and preached from Lee County on the south, to Jones County on the north, and as far west as Keokuk County, in a kind of irregular evangelizing. He is described by Bro. F. B. Lowery as a strong preacher, reasoning with great force and clearness. Arthur Miller came and labored for a time in Henry County, and returned to Indiana. Charles Rigdon in Keokuk County, Levi Fleming in Davis, and H. H. Hendrix in Wapello, and others, labored as they had opportunity, mostly at their own charges. Text from J. H. Painter, Iowa Pulpit of the Church of Christ. St. Louis: John Burns Publishing Co., 1884. Pages 441 - 469. Then there was complaining as John and Mary left Iowa. About this time Charles Levan, John Rigdon and other pioneers left the State, and a wild fever of emigration to Oregon and California swept away hundreds of Disciples, in places taking almost entire churches. John's son Stephen emigrated to Oregon in 1853. He married Zilphia Bristow, overlander of 1848. Her father, Elijah Bristow, had preceeded the family and was the first settler in Lane County. He built the first house, the first church, the first school and eventually, the first town in the Lane County. Unlike most other Bethany graduates, John did not focus on teaching school and working with the printed page. Graduate William Lysander Adams began teaching at the Black Hawk School. Levi Lindsay Rowland was the first college president at Monmouth. William Thompson Haley taught at Monmouth. The list goes on. John had been a church planter and had worked in the trenches before attending college. Additionally, John had vision problems that probably made the open spaces more appealing than struggling with the spaces on the printed page. At the 1853 annual meeting of churches in Oregon, John was appointed to work as an evangelist and "preached from Jacksonville, in the extreme south part of the state, to Steilacoom, in Washington Territory, on the north." It is with the soldiers of the Cross in Oregon as it was with the people of Israel, in the days when there was no king. Every one does what is right in the sight of his own eyes, still quite a number of additions are being made to the company of the disciples; and if the skeptic would honestly mark the progress of the Truth amongst us, I think that he would be forced to admit that the cause must be under the special guardianship of its Almighty author. John teamed up with the silver-tongued Alexander Vance McCarty to organize a handful of worshippers in Salem, Oregon. This was in 1855 and four years before Oregon was admitted to the Union. There is a profile of A. V. McCarty. The story of the Salem church can be reached on this link. Orval D. Peterson points out in his Washington-Northern Idaho Disciples that John Rigdon and Louis Casteel were involved in establishing the church in "the Arkansaw" settlement. This congregation soon moved to Castle Rock, Washington. The relevant portion of Washington-Northern Idaho Disciples is online. Rigdon and Casteel continued north and established a church in Elma, Washington in 1856. The story of the Elma Church is covered at this link. A new church was launched at the home of Stephen Ruddle in what has become Lacey, Washington, adjacent to Olympia. This was dated in 1857 and probably indicates a return trip after being in the area the previous year. His death was the result of poison, which some miscreat (sic) threw into the well at Dr. Markham's in North Salem last June. Deceased partook of the water and never recovered from the effects. 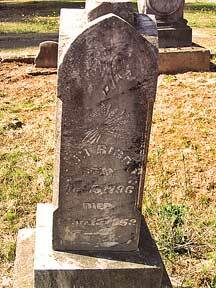 John, and later Mary, was buried in the quiet pioneer cemetery at Pleasant Hill. Though his circuit-riding days covered less than eight years, he left a profound impact on the Lord's church in Oregon and Washington. The index of the Pleasant Hill Cemetery can be searched online. Much of the early life of John Rigdon is based on the work of Jean T. Gillett of Sacramento, California. It came to us via Mary Rigdon. Without help from the family, such a record as this could not be assembled.